Sorry for the delay in sharing the eye candy. Sarah taught Stacy to paper piece. Check out the graffiti quilting. And back of Stacy's quilt. Check out the Quilting. Elizabeth's daughter's Kitty quilt is adorable. Yes, it really is 3D. Meg finished her Glam Clam. She was pretty proud. Sorry, Can't remember who did this one, but I think it looks like a round robin. In my favorite color combination too. Kristin is busy making baby blankets. I wonder why. Yep, now you can see why baby quilts are in her future. Kristen's mom made this one. Isn't it the adorable? Not sure if I like the front or back better. So cute. As part of the challenge, the guild hosted a sew-in at our sponsor's shop, The Quilt Shop. Anyone was welcome to come and stitch with us in their classroom area. We have plenty of flannel and cottons ready to go! Thank you to our member, Lynn B, who works with an organization that was able to donate supplies to the event! These blankets go together so quickly! Dive in and sew!! We were a small, mighty army of stitchers. At the end of the day, the car was packed with 43 finished NICU blankets! These blankets will be combined with the individual member donations at the March 2016 meeting and given to the Threads of Love organization. 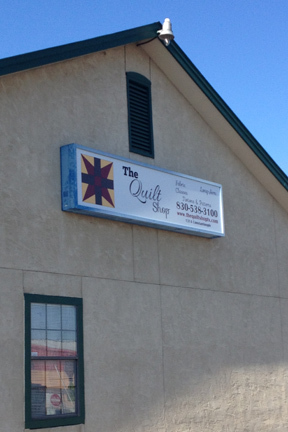 Thank you to The Quilt Shop for hosting us and providing some gorgeous door prizes! And if you missed the February meeting you missed a lot of love. Jen Eskridge, our VP for Charity and Outreach was handing out NICU kits to anyone who wanted to make one or two or ten. She had quite a few. The finished quilt is only 21" square and requires very little quilting and no batting if you use flannel. 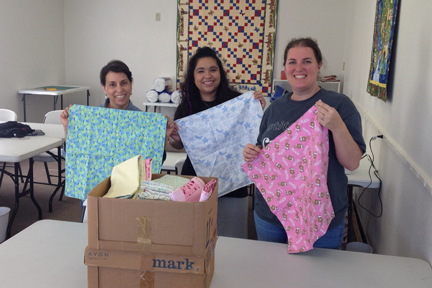 Threads of Love provides these to preemies. If you want to donate to this worthy cause, use your own stash, or ask Jen for a kit. Jen has put on a 2-month challenge to see how many we can all get done. And she has made it very easy for you. 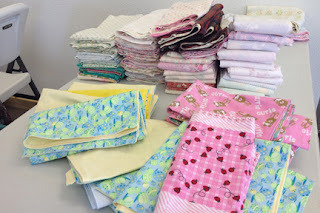 There will be a sew-in on Feb. 18 to finish up many of these Threads of Love NICU quilts. Watch for the invite on Facebook. She also had invited folks to bring in charity quilts in any stage of the process and others will work together to finish these for some other charities. If you're decluttering, this is a good way to find a home for those unfinished projects. There were a few on display at this meeting. Guild members will do everything if you just want to donate fabric. If all the top needs is quilting or binding and it's not something you'll ever finish yourself, you can let your fellow guild members finish for you. Decluttering netted our charity efforts some real beauties. 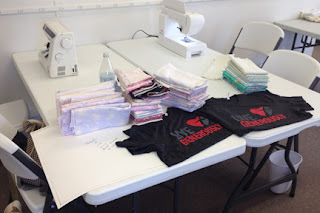 If you are willing to donate your skills, you'll be able to pick up tops that just need quilting, or maybe just binding. If you have some UFOs you've given up on, you can drop them off with Jen, and she'll be bringing these to meetings so folks can pick one up and finish it and donate it to a good cause. If you missed the meeting you also missed all the loving humps and bumps folks contributed to the block of the month. Jen Eskridge was the lucky winner and I'm sure she'll make something awesome -- maybe multiple awesomes. And Loretta, our creative BOM committee chair, brought some suggestions of how to use the blocks. Our next Block of the Month is a red bird on a yellow background. It was adorable and you had two choices (with or without wing). Loretta will be posting both in multiple sizes on Facebook soon. It's already posted on facebook, but in case you missed it, we have added a new page to our blog called resources. It includes listings and links for our guild member businesses, links and addresses for local quilts shops and no-so-local quilt shops, and a long list of links to other Modern Quilt Guild websites. Show some love to our fellow guild members when you can, and don't forget to love local and not so local small quilting businesses too. And if you need some inspiration or motivation. 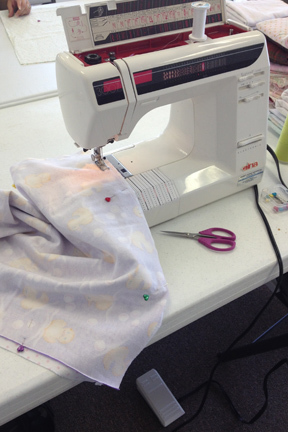 Check out what other modern quilters are doing at their own guilds and see if you can't find something there to love. Rebecca also asked if we could make a list of member blogs and list them on our blog. If you'd like your blog listed on the guild blog so others can check in on what you're doing and show you some love, provide your blog URL to Cathy by email or FB messenger. You also missed one of the things I love most about our guild, the announcement of our next Quilting Retreat at the Main House in Kerrville. All the details are on Facebook. If you didn't already reserve your slot, you can send a deposit to Sarah to hold a spot just for you. Rebecca, our fearless president, announced two challenges. For the first challenge, she provided everyone at the meeting a ribbon with the SAMQG logo and a pin to be used to make yourself a modern nametag. We have quite a few new members and to help get to know each other, we are asking everyone to wear a name tag. If you don't have a home made fabric name tag, there will be paper versions for you to wear, but we're hoping everyone takes the time to participate in this challenge and make themselves a new name tag even if they already have one or two or ten. The challenge is to make any kind of modern design name tag in any size you'd like, somehow incorporating the ribbon, and bring them to the March meeting. If you need a ribbon, contact Rebecca, she had plenty of extras. We'll show off our new nametag at the March meeting and members will vote for their favorite tag in different categories. Prizes will be awarded. Don't we all love prizes? And I know I love meeting new members. So a lot of love on this challenge. The second challenge is her President's challenge for this year. She admitted that being able to host this challenge is the main reason she wanted to be our leader. She loves this challenge so much, she's already made her quilt for the challenge and had so much fun she's thinking about doing another. The challenge is to create a quilt based on someone who inspires you (you can read this as someone or something you love). An author, musician, poet, artist -- check out your favorite (aka most-loved), get inspired and make a quilt of any size, color or technique. You're sure to love it and we'll love seeing it. In April you'll be asked to bring in your inspiration, whatever/whoever it is. Then, at the July meeting, the finished challenge quilts will be revealed. I'm sure we'll all love the eye candy that results. Sew-n-Tell was great this month. I loved it and I'll post that in a separate blog post. And you'll be able to find some on facebook, some on Instagram, and others here on the blog. We'll continue to do that in the future. In an effort to receive feedback from our members and not send out another survey, poster boards with questions were placed around the room for you to provide some input to the board on improvements or ideas you have about the guild, building community, education opportunities, and community service/charity. If you're interested in providing your feedback, let one of the board members know and we'll provide you the questions too. Our presentation, Technology's Role in the Quilting World, ended up being a round robin as there were some issues with the technology in the room. Guild members shared loads of information and tips on using Instagram, Periscope, Blogs and other technology. The provided a lot of reasons for quilters to love technology. I'll add some of the tips I picked up to the Sew-n-Tell pics in another post. I know some of our members have found so many ways to use technology to support their quilting but this opened my eyes to other things I could do myself. Thanks to all the presenters. I loved it (bet you saw that one coming). Enjoy the month of Love. Hope you get time to quilt.